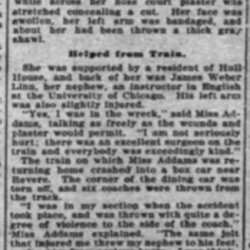 Subject is exactly "Addams, Jane, interviews"
Addams reflects on the railroad crash she endured and gives her impressions of the General Federation of Women's Clubs meeting. 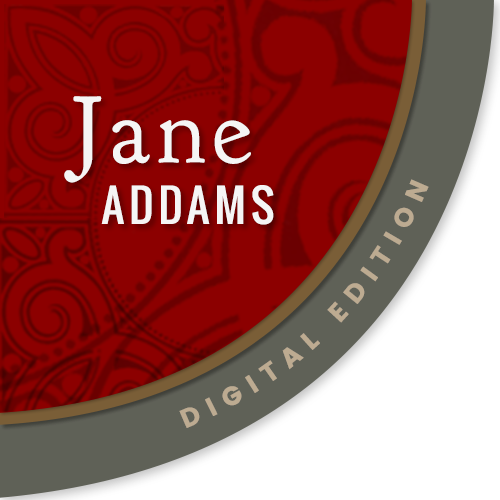 Interview with Jane Addams on education and public schooling. 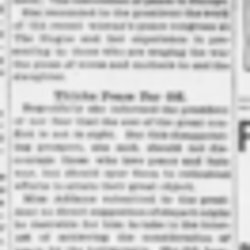 In an interview with James Evan Crown, Addams discusses the impact that woman suffrage is having on society. 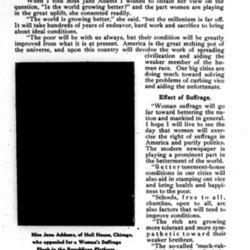 Addams later denied having taken part in this interview, specifically her comments on the poor. 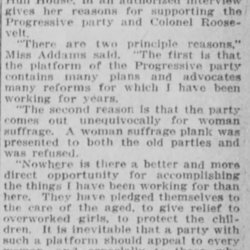 Addams discusses the impact of the Republican convention on the woman suffrage movement and presents her appeal to the platform committee. On June 19, she addressed the Party's platform committee, and her remarks are included here. 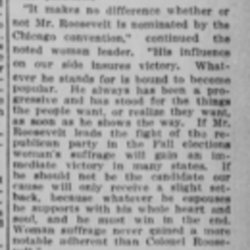 In a newspaper interview, Addams offers her reasons for supporting the Progressive Party and Theodore Roosevelt. 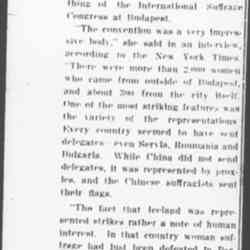 A summary of Addams' remarks to the New York Times about the wide range of represented countries at the International Suffrage Congress. 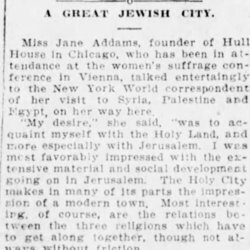 Addams speaks about her trip to the Middle East and the Zionism that was flourishing at the time during her visit to Jerusalem. 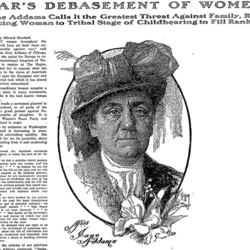 She concludes that the suffrage movement has become universal. 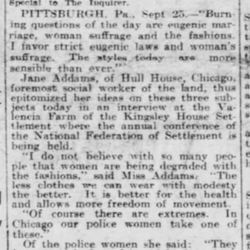 Addams is quoted on her views on fashion, eugenics and suffrage. George W. Perkins discusses the Woodrow Wilson administation and the government's efforts to break the monopoly of the American Telephone Company. Bok thanks Addams for editing his interview with her, and congratulates her on the International Council of Women's promise. 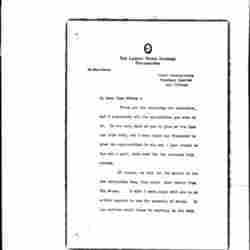 An interview with Addams, by Marshall, right before she leaves for the The Hague peace conference. In this interview Addams discusses the importance of the conference and of women's peace movements. 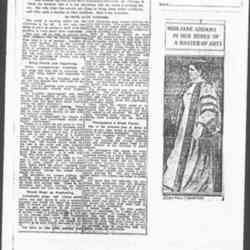 Addams tells a reporter from the Manchester Guardian her impressions of the International Congress of Women. A short summary of her remarks at Kingsway hall is also included. 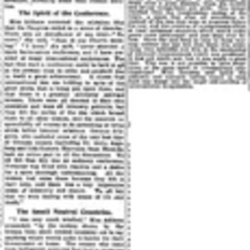 Addams talks with New York Times reporter Edward Marshall about World War I and the efforts of the International Council of Women to start peace negotiations. 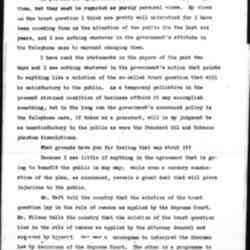 Lynch requests an interview from Addams about the Woman's Peace Party. 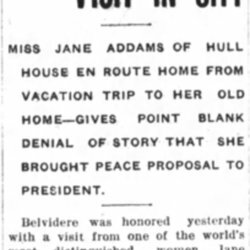 An extended interview with a Chicago Tribune reporter on Addams's efforts for peace and the work of the International Congress of Women. 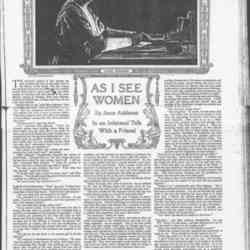 Addams gives an interview on the state of women in America. 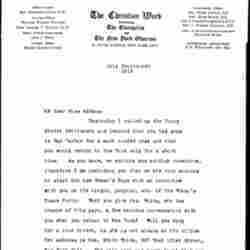 Addams clarifies fact from rumor with regard to stories about her meeting with Woodrow Wilson.